What Is Meant by “TICI”? cMinnesota State University (A.M.K. ), Mankato, Minnesota. BACKGROUND: In 2003, Higashida et al proposed the Thrombolysis In Cerebral Infarction scale to evaluate angiographic intracranial flow. Our aim is to review how subsequently published studies define TICI. MATERIALS AND METHODS: We used the ISI Web of Knowledge and SciVerse Scopus databases to search for “TICI” and “thrombolysis in cerebral infarction” and for articles that cited the original TICI paper from January 2004 through May 2012. Articles were categorized according to their definition of the TICI categories, typically grades 0–4, with grade 2 (partial reperfusion) subdivided into 2a and 2b, and rate of contrast entry to the perfused area. In addition, we catalogued the type of redefinitions of TICI subcategory 2 and additions of new categories. RESULTS: Of 236 articles screened, 74 were included. Eight (11%) explicitly followed the TICI scale as originally defined. Thirty-seven (50%) cited Higashida but did not define their scale. Fifteen (21%) used and explained modified scales. Thirteen (18%) used the term TICI, but did not define the scale and did not cite Higashida. Eighteen (24%) specified a 2a subcategory. Nine defined grade 2a as <67% filling, 6 defined it as <50%, and 3 did not offer a percentage. Two studies added a 2c subcategory. Fifty-two (70%) used a cutoff level to define “successful reperfusion.” Of these, 65% used TICI ≥2, 33% used TICI ≥2b, and 2% used TICI = 3. CONCLUSIONS: There is substantial variability in the definition and/or application of the TICI scale in the literature. This variability could considerably impact our understanding of results of revascularization studies. The Thrombolysis in Myocardial Infarction scale is a widely applied, graded response scale for assessment of treatment outcome in the coronary arteries.1 In 2003, Higashida et al2 proposed a seemingly simple modification of the TIMI scale to evaluate intracranial perfusion assessed in cerebral angiography. This new scale, the Thrombolysis in Cerebral Infarction scale, was intended to standardize the grading of angiographic outcomes, particularly for trials of endovascular treatment of acute ischemic stroke (Table 1). As originally described, TICI categories span from no perfusion (grade 0) to complete perfusion (grade 3). The “partial perfusion” category (grade 2) is defined as cases in which contrast passes the obstruction but with rates of entry and washout slower than normal and is subdivided into 2 subcategories, 2a and 2b. Although the TICI scale has achieved fairly rapid acceptance into the medical literature, the scale was somewhat arbitrarily created and has not been validated or tested systematically. Although the TICI scale has been criticized because of confusing internal inconsistencies,3 it is still widely used in the literature.4 Modifications of the TICI scale have been subsequently proposed, such as a change in the definition of the 2a subcategory (to indicate <50% filling of the vascular territory) or by the addition of a 2c subcategory.5 Our current aim is to review published studies that use the TICI scale to describe how the TICI scale is defined and utilized across studies. We performed a search of the medical literature by using the ISI Web of Knowledge and SciVerse Scopus databases. We searched for the terms “TICI” and “thrombolysis in cerebral infarction.” We also used these databases to search for all articles from January 2004 through May 2012 that cited the original TICI paper. In addition, we reviewed the reference list from all identified articles to identify other papers by using graded response scales for cerebral perfusion, whether or not these papers referenced or utilized the original TICI paper. With our literature search, we identified a total of 236 articles. We excluded articles that did not relate to the TICI scale (115 articles) and articles that were in languages other than English or that were not accessible in full length (49 articles). We qualitatively assessed whether the definition of TICI in each article adhered to the original definition of the TICI scale and evaluated the articles that were cited when TICI was described. We then accordingly categorized the articles into 4 groups: 1) articles that explicitly stated the scale and followed the original TICI scale completely, 2) articles that did not explicitly define the scale but cited the original TICI paper, 3) articles that defined a modified scale, and 4) articles that used TICI but did not define the scale and did not cite the original TICI paper. We also catalogued the type and number of definitions of subcategory 2a and noted if a subcategory of TICI was used as a threshold for “successful revascularization.” This study was exempt from institutional review board review. Of 74 total included articles, 8 (11%) followed the original TICI scale completely and explicitly stated the categories.6⇓⇓⇓⇓⇓⇓–13 One article claimed to have followed the scale completely but did not state the categories.14 Thirty-seven (50%) articles did not explicitly define the scale but still cited the original paper by Higashida et al.15⇓⇓⇓⇓⇓⇓⇓⇓⇓⇓⇓⇓⇓⇓⇓⇓⇓⇓⇓⇓⇓⇓⇓⇓⇓⇓⇓⇓⇓⇓⇓⇓⇓⇓⇓–51 Modifications of the TICI scale were used in 15 (20%) articles.4,5,52⇓⇓⇓⇓⇓⇓⇓⇓⇓⇓⇓⇓–65 Of these, 8 cited only the original TICI paper, 4 cited the original TICI paper and other papers, and 3 cited only other papers. Thirteen (18%) articles used TICI but did not define the scale and did not cite the original TICI paper.13,30,56,66⇓⇓⇓⇓⇓⇓⇓⇓–75 These results are depicted in Fig 1. 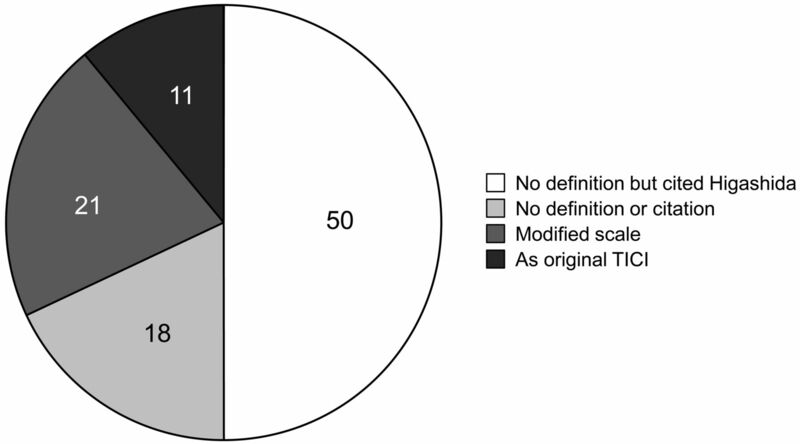 Distribution of definition and citation of the TICI scale in the literature. Articles in the English literature that use the TICI (Thrombolysis in Cerebral Infarction) grading scale, distributed according to definition and citation of TICI. Eighteen (24%) of articles mentioned the rate of contrast filling in their use of TICI. Most modifications of TICI eliminated the subcategories of 2a and 2b. Only 18 (24%) articles specified a 2a subcategory. Of these, 9 defined 2a as filling of <67% of the affected vascular territory (compatible with the original TICI) and 6 defined 2a as filling of <50% of the affected vascular territory. A 2c subcategory was added in 2 articles, and a category 4 was added in 1 article. Examples of the variability in definitions of TICI categories are detailed in Table 2. Most articles (n = 52, 70%) defined a threshold within the TICI scale that indicated “successful revascularization” as one of the study end points. Of these, 34 (65%) used TICI ≥2, 17 (33%) used TICI ≥2b (although only 1 of these studies defined a precise cutoff for 2b; 67% filling of the vascular territory), and 1 used TICI = 3. These thresholds for successful angiographic revascularization were prespecified in the methods in 40 (77%) of these articles. The term “TICI” connotes a standard and widely accepted metric of revascularization, analogous to the ubiquitous TIMI outcome for coronary revascularization. In the current study, we found substantial variability in how the term “TICI” scale is both defined and used in the recent English literature. Far from being a consistent and universal scale, we noted that only a small minority of studies, by use of the term “TICI” when reporting outcomes after revascularization, actually used the original TICI scale. Furthermore, many studies failed to provide sufficient detail to allow the reader to understand exactly what categories were used. Finally, the definition of successful revascularization varied widely among studies. These current findings are relevant for several reasons. First, our understanding of the current literature has the potential to be greatly affected by these findings. The modification that changed the cutoff point between TICI subcategories 2a and 2b has particular relevance because a grade on the TICI scale ≥2b was used as an end point to define successful reperfusion in one-third of the articles that specified this end point in our study. Second, the definition of TICI will affect study design for future trials of endovascular therapy for acute ischemic stroke. The TICI grading scale is increasingly used to define end points of revascularization success in studies. If we define success as achieving a certain grade of TICI (eg, TICI 2b) but we do not have consistent grading systems, we cannot compare or combine results of clinical studies. To achieve enough patients for studies to be powered adequately, it is necessary for investigators from different centers to collaborate together. Without a standardized grading scale, this will not be possible. It is essential that we communicate clearly with consistent terminology. This study has several limitations. Some articles from our literature search were not reviewed because of a lack of accessibility of full-length articles or because they were written in languages other than English, creating a selection bias. However, increasing the number of studies we reviewed may have increased the observed variability in TICI definitions. Also, the categories into which articles were divided were subjectively chosen and were evaluated by only 2 investigators. Further opportunities to refine our grading scales and further our understanding of brain reperfusion abound. Weaknesses in current grading scales for cerebral perfusion are not limited to confusing terminology. Vessel recanalization in the treatment of acute ischemic stroke has been shown to be associated with favorable clinical functional outcomes, but when reperfusion is only partial, the clinical relevance of the use of different TICI grade 2 subdivisions is not known. Furthermore, there are few data regarding the intra-observer and interobserver variability when applying the TICI scale to angiography results. It also remains unclear whether it is appropriate to apply TICI to the posterior circulation and whether the degree of collateral flow—particularly in cases with distal M3–4 occlusions—modifies the effect of revascularization (as measured by TICI) on clinical outcomes. Scales are designed to aid in the objective description of angiographic results, standardize data for research studies, and assist in outcome prediction.79 We hope that by clarifying what we mean by “TICI,” we will be better able to evaluate the efficacy of revascularization therapies for acute ischemic stroke in the future. There is substantial variability in how the TICI scale is defined and applied in the cerebrovascular literature. Few studies provide sufficient detail for readers to understand what is meant by each TICI grade. Because TICI score is increasingly used as an outcome measure in studies of revascularization therapies in acute ischemic stroke, this variability has the potential to considerably impact results and our understanding of these therapies. Disclosures: David Kallmes—UNRELATED: Consultancy: ev3;* Grants/Grants Pending: MicroVention,* Sequent Medical,* ev3,* Benvenue Medical;* Travel/Accommodations/Meeting Expenses Unrelated to Activities Listed: Codman* (*money paid to institution). Accepted after revision December 13, 2012. You are going to email the following What Is Meant by “TICI”? Weekend effect in endovascular stroke treatment: do treatment decisions, procedural times, and outcome depend on time of admission? Clinical Impact of Ventilation Duration in Patients with Stroke Undergoing Interventional Treatment under General Anesthesia: The Shorter the Better?